Taber novice ‘A’ Oil Kings team made it all the way to the final of the Shawn Anderson Memorial Tournament, earning the silver medal, after a tight 5-4 loss to Irvine Bulldogs in the championship. The Oil Kings held a 4-3 lead heading into the third period, before the Bulldogs scored two unanswered goals, including the game winner with 3:51 left in the contest. Ethan Volk tallied twice for the Oil Kings and Jenner Workman and Lincoln Wiebe had singles. Delphin Deboer and Wiebe had two assists apiece. MIDGET: Taber midget Oil Kings had a strong start to its hockey provincial playdown series, beating Coaldale Cobras 8-0, with half the Oil Kings goals coming off the power play. Peyton Poncelet and Michael Stronge both had two goals apiece. Spencer Phillips, Dawson Hendricks, Cole McClelland and Byron Kress had singles. In regular Central Alberta Hockey League play, the Oil Kings skated to a 1-1 draw with Brooks on Saturday on the road. Kress scored the lone Oil Kings tally. 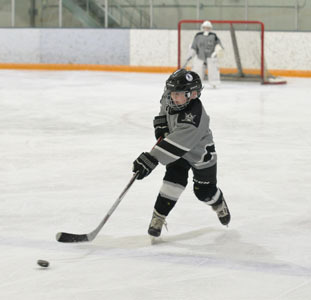 The team then skated to a 5-2 victory over Okotoks Oilers on the road on Sunday. Scoring was spread out, with Hendricks, Braxton Kinniburgh, McClelland, Kress and Poncelet notching singles. Kinniburgh and Kress each had two assists apiece. ATOM: Taber atom Oil Kings skated to a 7-1 victory over Lethbridge Hurricanes in Central Alberta Hockey League play on the road on Sunday. Konnor Wiebe and Ayden Umbach both had two goals apiece. Nixen Miller, Ryler Kiss and Chase Stronge had singles. Wiebe and Lincoln Weiss both had two assists apiece.